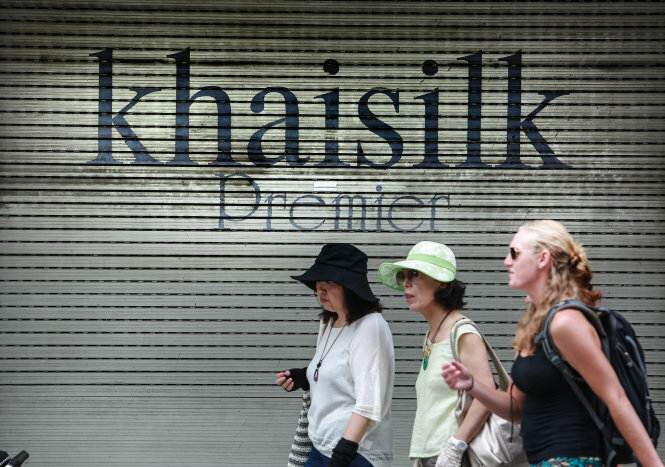 While Khaisilk, a premier Vietnamese silk brand, has had to shut down some outlets following two scandals regarding the origin of its products last year, the fate of the company remains unclear as no final conclusion on how its violations may be handled has ever been released. Founded in the late 1990s, Khaisilk scarves were considered a premium product, popular amongst local luxury consumers and international tourists. However, the company’s reputation and business were marred last October when one of its scarves was found to have both a ‘Made in China’ label and a ‘Made in Vietnam’ one. More than nine months since the crisis, Khaisilk store chains have been inactive with some outlets even rent out. When Tuoi Tre (Youth) newspaper reporter came to the Khaisilk store at 101 Dong Khoi Street, District 1, Ho Chi Minh City, the venue was leased by another fashion brand. Similarly, the Khaisilk store in Lotte Legend Hotel on Ton Duc Thang Street in the same district has been closed for months, according to a receptionist at the hotel. Phan Hoan Kiem, head of Ho Chi Minh City market administration, affirmed that all Khaisilk outlets were suspended of operation since it underwent inspection from the municipal market watchdog last year. The situation is no brighter for Khaisilk’s stores in Hanoi. The Khaisilk Hanoi Main Store on Hang Gai Street has had its doors shut since it was inspected in the wake of the mislabeling scandal, according to local residents. In October 2017, a company, known only as V., ordered 60 Vietnamese silk scarves as gifts for its partners from the Khaisilk Hanoi Main Store. The products cost VND644,000 ($27.69) each. When the products were delivered on October 17, the buyer discovered that one of them had both ‘Made in China’ and ‘Made in Vietnam’ labels. The buyer immediately requested to make a record of the case and later filed an official complaint to the company headquarters. Coming hot on the heel of this scandal, on October 26 the same year, the Ministry of Industry and Trade requested a probe into the company’s product origins, whereas the General Department of Taxation on the next day also demanded an investigation into the taxpaying activities of Khaisilk. Hoang Khai, a real estate tycoon and chairman of Khaisilk Group, later confessed in an interview with Thanh Nien (Young People) newspaper that in the 1990s, when the Vietnamese silk sector started to decline, he was forced to turn to the Chinese market to source beautiful products which he believed could be taken as Vietnamese. Hoang Khai owns 99 percent of Khai Duc Co., the operator of the Khaisilk store chain. The Khaisilk chairman asserted that he was convinced that it was a common practice, saying such brands as Zara and H&M also source products from China and sell under their own brand names to customers worldwide. He claimed that the practice is ethical as long as product quality is guaranteed. However, the inspection’s conclusion, released on December 12, 2017, left local consumers shocked, as the company apparently did not source its products from China, and its silk merchandise did not seem to be made from silk. According to the trade ministry, while the company markets its products as ‘made of 100 percent silk,’ tests have found that some of the samples contained no silk at all. The company has also violated laws in terms of tax, receipt management, product labeling and origin. The ministry underlined that Khaisilk’s brand owner has concealed information, or provided insufficient, inaccurate or misleading information regarding its products to consumers. The company has allegedly mixed products of various origins with its made-in-Vietnam stock, but failed to keep consumers informed of the true origin of the merchandise. According to customs data, Khai Duc imported fashion products from Thailand and China between 2006 and 2009, but no such importation was recorded between 2009 and October 15, 2017. The Khaisilk brand owner had also stopped outsourcing silk products from local manufacturers since 2012. Instead, the company sourced ready-to-use products from other stores and shops in Vietnam and replaced their labels with either the “Khaisilk®”, “Khaisilk cach dieu” or “Khaisilk Made in Vietnam” labels before putting them on sale through its chain. During a discussion with Tuoi Tre on Thursday, a leader of the Market Surveillance Agency under the Ministry of Industry and Trade said that he has yet to received any official information on prosecution of the case. According to a member of the interdisciplinary inspection team pursuing Khaisilk’s violations, the case was transferred to the investigation police under the Vietnamese Ministry of Public Security, but the department has so far initiated no legal proceedings against the case. The inspection team has performed all its duties to find out Khaisilk’s mislabeling and criminal violations, he added. “The next steps are the police’s responsibility. We are also expecting actions [from the investigation police] before long,” the member said.